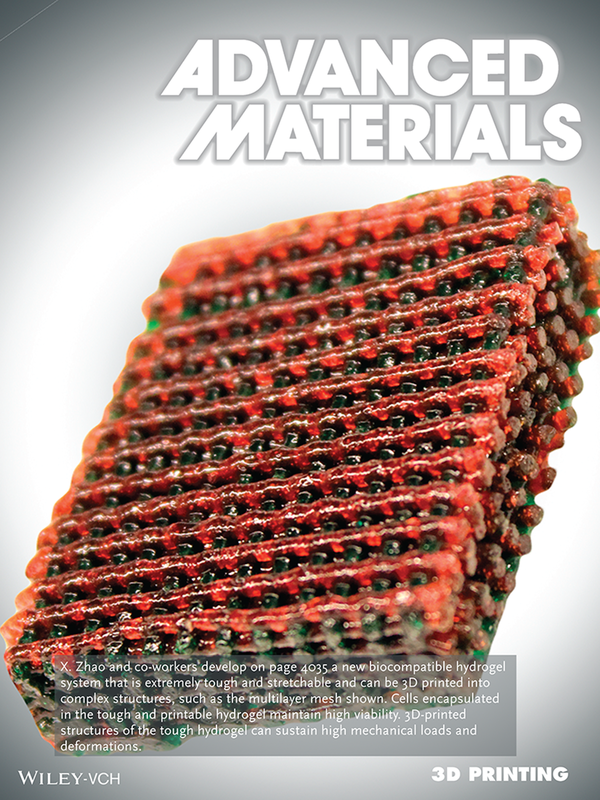 Sungmin Hong, Dalton Sycks, Hon Fai Chan, Shaoting Lin, Gabriel P. Lopez, Farshid Guilak, Kam W. Leong, Xuanhe Zhao, Advanced Materials, 27, 4035-4040, 2015. While tough hydrogels are being intensively developed, the application of these hydrogels is often severely limited by their incapability to encapsulate viable cells or form functional three-dimensional (3D) structures. This work present the world’s first robust hydrogel system, which is tougher than articular cartilage yet capable of encapsulating cells with high viability and being printed into various functional 3D structures. The new material and novel 3D printing method reported in this paper will not only advance fundamental material science but also have impactful technological applications in diverse areas.